This classic, green and creamy sauce is making a comeback - probably because it's a truly lovely and versatile sauce that's easy to make, lasts for days and is good with eggs, beans, smoked salmon, roast meats and barbecued fish. The sauce will last for three days in the fridge, but is best fresh. 1. Slice each tomato differently - some slices, some chunks, some quarters - to get a variety of textures and shapes. Toss in olive oil, sea salt and pepper and set aside. 2. To make the dressing, whizz all the ingredients except lemon juice in a blender until smooth, green and creamy, scraping down the sides once or twice. Add the lemon juice to taste, whizzing again, and refrigerate before using. 3. 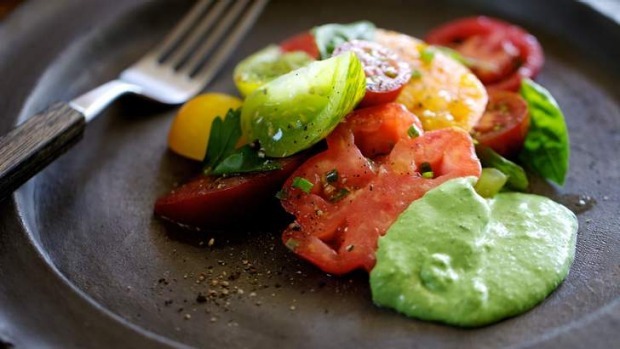 Strew the tomatoes on each plate, scatter with a few extra herbs and serve with a goodly spoonful of green goddess.